Matthew Flinders, was amongst the most accomplished navigators and chart-makers of any age. In 1798 he sailed south from Sydney in the sloop Norfolk, passed through Bass Strait and circumnavigated Van Diemens Land (Tasmania), thus proving it to be an island. From 1801 to 1803 he circumnavigated mainland Australia in HMS Investigator. SYDNEY. 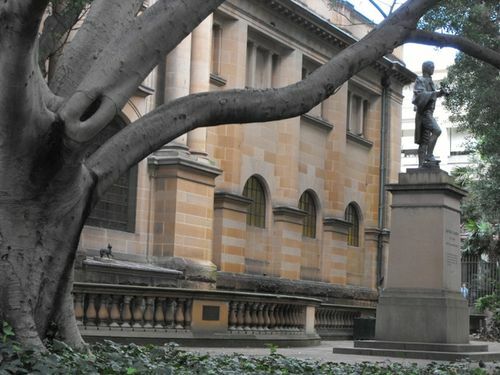 — A bronze statue of Matthew Flinders by the late W. R. Colton, R.A., erected in Macquarie-street, was unveiled on Thursday by the State Governor. Flinders was one of the world's greatest hydrographers. He sailed to Australia in the Reliance in 1795, and came back later in the Investigator and surveyed the coast. After having spent six and a half years a prisoner of war at Mauritius, he returned home and died in 1814. A grandson is Professor Sir W. Flinders Petrie, of Melbourne, who will bequeath Flinders`s journal and private papers to the Mitchell Library, opposite which the statue has been placed. Admiral Sir Dudley de Chair said Flinders was a captain in the navy in the most brilliant period of its history. He contributed largely to the science of navigation, and was the first to discover the connection between the rise and fall of the barometer and the direction of the wind. Age (Melbourne), 23 October 1925.